A1 Dutch-Lite Greenhouse: The 1 Dutch-Lite Greenhouse is a wooden greenhouse with a stunning design that is sleek yet traditional. The front single door slides to the left and is easy to use and is half boarded for a rustic look. 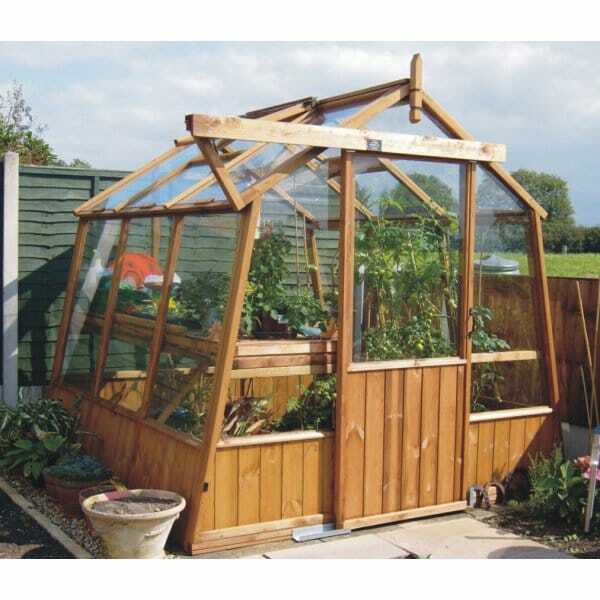 This greenhouse is wider at the base and so means you can have extra storage base underneath the staging/shelves. The included staging can be placed on the left or right hand side to suit your needs. The single opening vent allows you to control the temperature so your plants won't bake in hot weather, nor get too cold in winter. Ventilation can similarly be improved with leaving the door open. The optional rain guttering kit fits on both sides of the greenhouse and will direct water away from the base of the greenhouse or into your rain water collector.